Most everything survived winter of '17, which was January 6 - 8. Seriously, we had a hard freeze those three days, and that was it, winter was over. 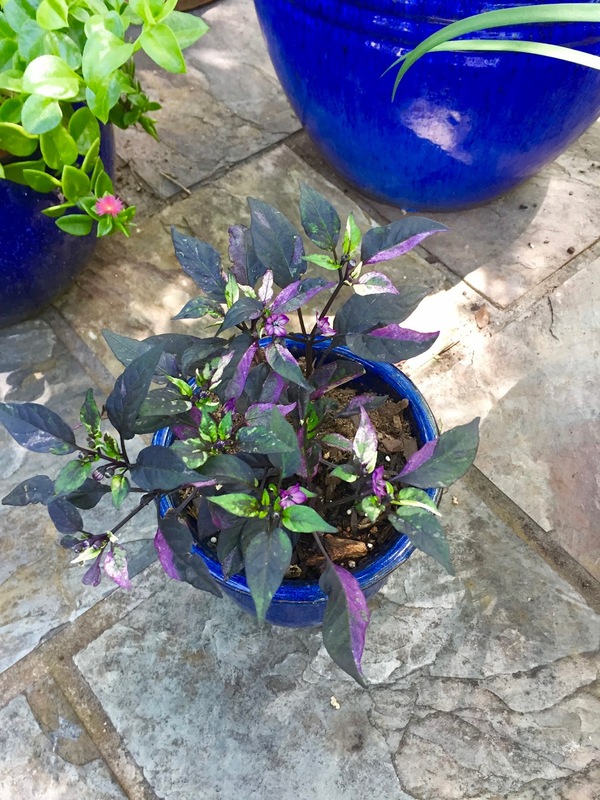 We needed a little something for this little pot and Jeff picked out this purple flash ornamental pepper - it's so pretty! Just an annual, but hey, for four bucks, if it lives through the summer, the color enjoyment we'll get will be worth it. My bougainvillea! We used to have these growing along our back fence at our house in California, but they don't live through the winter here in Texas, so I've always been reluctant to buy one. However life is too short to not have a beautiful blooming bougainvillea if that is your heart's desire, so we splurged and $18 later, here it is...and I know I'll love seeing it out my windows every day. The front yard needed a lot of weeding in the beds, plus our oleander bushes froze; they are coming back, but all of the dead limbs needed to be cut off, so I did that. All I can say is thank goodness I bought myself some garden gloves recently, because I was a lot more willing to get into the dirt with them; somehow knowing that my skin will not have first contact with bugs and other crawling things made this a much more pleasant task. See the one bit of greenery by itself? That's all that came back from last year's lantanas. I love that this batch has three colors - the orange, yellow, and pink just drew me in! I'm putting this shot in as a "before" shot to show how much the plant grows over the next few months. This area needed work - I pulled out all of the pots, we weeded, and Jeff got the stones that the pots are sitting on back to being level. Then we put everything back and laid down new black mulch. This plant - a dracena red sister, replaced one plant that had gotten really sticky and ugly, plus it mostly froze. I can see the pink leaves through the window while I'm sitting at my desk, and it makes me happy. I think this is portulaca - honestly, I just loved the flowers, saw that it needed full sun, and boom - this empty pot had a new occupant! There is still one more empty pot just to the left of this plant that we need to fill, but we miscounted when we were at Lowe's, so came home one plant short. 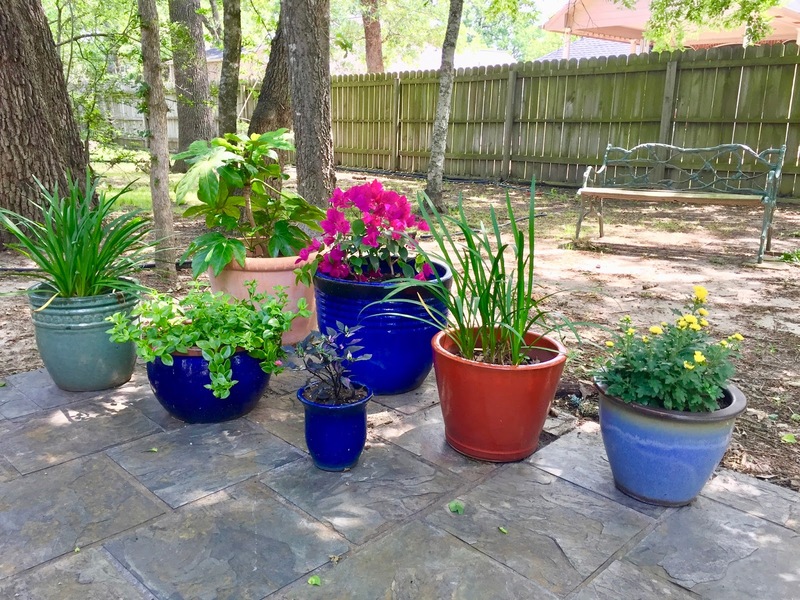 Once we get that last pot filled, we can call this area finished - unless we find some more pots at a great price...then filling in with more color might be nice. Here's the oleander that I cut down, and here's also where we ran out of mulch, darn it! I thought we had bought too much, but nope. Oh well, it was getting hot anyway so we were ready for a break. Soon enough, we'll get the rest of the mulch and THEN we'll really be done. Hammock stand works quite nicely to air dry gloves! I wash my gloves every time I use them pretty much so in my book, not weird. All your hard work made for some great results - everything looks so pretty! I love bougainvillea--when I was in Florida in March, it was in full bloom and it was glorious! We just don't have that kind of foliage here in the midwest. The seasons are way too short. Your garden looks nice! It is a pretty showy plant, that bougainvillea - I'm thinking about getting one for the front yard's empty pot for an experiment to see which location does better. Yeah, that's my reasoning...not because I could see two of them from my perfectly-located desk, LOL. We have a lawn guy come mow and edge every couple of weeks and it's wonderful...the yard looks great, and Jeff hasn't had to spend what little time he's at home mowing. Totally worth it. Wow! I love the look. 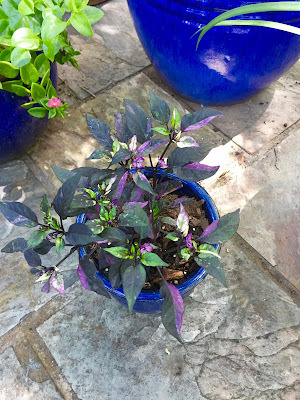 I really like that dark mulch--very dramatic, and it sets off the pots so nicely. I vote yes for another bougainvillea for the empty front pot :) I can hardly wait to get mine this year. The color you got is the same color we had on our porch in Fremont when I was a kid. I love the dark mulch, too - there was a communication breakdown *ahem* and somehow the mound in our grass that has red yucca plants and a few big rocks got covered with leftover brown mulch...sigh. Your plants look great! I was at one of my favorite stores not to long ago and they had all their fairy garden stuff on sale and I thought of you. Do you think you will start one? I love bougainvillea. I saw them in Florida in March when I was there. Still too early for flowers here. The trees are just starting to bud. I love seeing you pics. Keep them coming. Thanks! Do you get bougainvillea at all in your neck of the country? Washing garden gloves, hmmmmm. I don't do that LOL. I use them almost every day, so there isn't a point. I will rinse them off if I have been in the mud. I love all your pots! I will be doing more container gardening this year (hopefully). It still looks bare with new beds at this house. 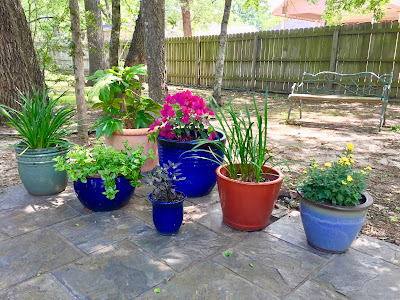 I love container gardening - the hardest part is finding pots at a reasonable price, but last year our grocery store had a great selection, so I'm hoping they get them in again this year. Beautiful! 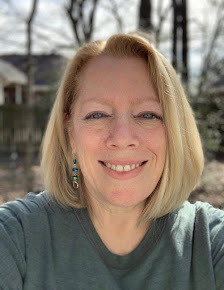 I just love spring and all of its fresh and vibrant colors!! Our winter sounds just like yours - it lasted a whopping two days then disappeared again! I like a short winter, but that was a little ridiculous, wasn't it? It all looks so lovely and so many colors, love it. We had our gardener over 2 weeks ago. They were with 2 people and worked from 7 am till 11 am to clean the garden up after Winter. No way I'm doing that myself. I did it once and it took me 2 days. Now all I have to do is remove weeds the rest of this Spring/Summer. It's much easier to keep up with, rather than have to muck out everything yourself, I agree. Your containers give me #gardengoals. Still too wet and cold to plant anything here, but soon....can't wait. Have a wonderful Wednesday! Love those pots and all the great colors. Your bougainvillea purchase has inspired me to buy a hibiscus. They are always around here, but more expensive that I usually spend on plants (that I may, or may not, keep alive). I'm buying the dang hibiscus this summer even if it isn't hardy.